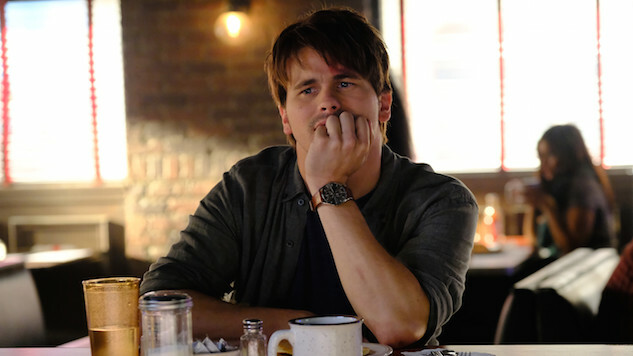 Jason Ritter is one of those actors you fall for the minute he’s on TV. Viewers first came to know him as Amber Tamblyn’s brother on Joan of Arcadia and rooted for him when he romanced Lauren Graham on Parenthood (#TeamMr.C.Forver). Over the years, he’s appeared on shows as varied as Girls, Goliath, Gravity Falls and Another Period. Now Ritter, the son of the late John Ritter, headlines the new ABC dramedy Kevin (Probably) Saves the World. He’s a guy who has lived a self-absorbed life until his world is upended when his girlfriend breaks up with him. After a suicide attempt, Kevin returns to his childhood home in Texas to live with his widowed twin sister (JoAnna Garcia Swisher) and her teenage daughter (Chloe East). He’s kind of holding it together until he meets Yvette (Kimberly Hébert Gregory), who tells him he is the last righteous soul and he must find the remaining 36 righteous souls who protect the world. One big problem? Only he can see Yvette. Paste recently had the chance to chat with Ritter about his new series, its spiritual aspects, and the secret to his long career. Paste: I imagine you get sent a lot of scripts. What was it about this script that made you want to do the show? Jason Ritter: I think it was different from anything that I ever read. It was funny. I was moved by it as well. It was such a fun, exciting character for me to play. It seemed like a challenge, but so much fun to be this guy who is having conversations with someone who is not there to the rest of the world. Paste: There’s a lot of talk that Kevin’s not a great guy, but he doesn’t seem so bad to me actually. Ritter: He’s not a malicious person. When he says he’s not a good person, it’s because he’s let people down. He’s taken people for granted. Like so many people, he’s gone, “I’ve got to do what’s right for me and everyone else is on their own.” That can kind of leave a wake of people hurting from your actions and he’s always sort of justified it because he’s never really examined what can actually make you happy and what’s better for you. Paste: And when viewers meet him he’s just attempted suicide. Ritter: He’s always thought if it looks good then happiness will sort of come later. That hole in him has grown and grown and grown. His suicide attempt was kind of the final thing. When you set up all these external things to make you happy and you don’t work on any of your infrastructure, when all of that stuff goes away— which it can at any time—you’re not left with anything that can sort of bolster you in those times. He’s identified happiness and success with all of these external things. Paste: Can you relate to Kevin? Ritter: Even though this is the most wild and out there story, this was the most me of any character that I’ve played, for some reason. There is an element of me in him too. I’ve definitely I’m guilty of “I’m barely holding on to myself so good luck family and friends. Hopefully you’ll all be there when I’m come out of the thing I need to focus on.” There’s a part of Kevin I enjoy which also feels like a secret little part of me that I don’t like to show the world. Just this sort of thing where I don’t want to do this, I don’t want to go to that thing. There’s something sort of refreshing to let that part show—that lazy, selfish, whiny part. Paste: As a fan of Joan of Arcadia, I saw some similarities between the two shows. Did you? Are you drawn to shows that have this spiritual angle? Ritter: I think the thing that I responded to in Joan of Arcadia is a similar thing that I responded to in this. The idea that the world is not just what we can see and prove. There’s some kind of plan or system. Anybody who believes there can be sign. Anyone who looks at coincidences and doesn’t just go, “Well, we’re a bunch of random atoms bouncing around in the universe.” Anyone who goes, “That feels too crazy to just be random.” I think that through line goes through so many different kinds of people, no matter what you believe. The idea that we don’t know everything yet. Paste: You always seem to have a bunch of projects going on at once. What else can people see you in? Ritter: The Long Road Home [on National Geographic] is an incredible true story based on the book by Martha Raddatz. She interviewed all these soldiers and families of these soldiers who were ambushed down during a peacekeeping mission in Baghdad [in 2004]. I play Captain Troy Denomy—he wasn’t in the platoon that was pinned down. He was on the base and he goes out to try to rescue his people. I’m also in Another Period on Comedy Central. I think it’s coming back in February. It’s as broad and crazy as it gets. We’re all really going for it. But it’s a lot of fun my character who is one of the dumbest people to ever walk the planet gets higher and higher in his government office. Paste: What do you think has allowed you to do everything from drama to dramedy to comedy to farce? Paste: You obviously come from an acting family. Was there ever a time you didn’t want to act? Ritter: When I hit 11, 12, 13… those self-aware teenage years, the idea of acting was a terrifying, horrible idea. You are asking for me to have more people look at me? I want to disappear. At that point I kind of got out of acting, got into music, picked up bass guitar. Bassist are way in the background. You just kind of grow your hair long and are a mysterious bassist in the back. Towards the end of high school I remembered how much I really loved it, but I did get super shy at one point. But even in my shy stage with my friends and stuff I was still sort of a goofball. Kevin (Probably) Saves the World airs Tuesdays at 10 p.m. on ABC.